The election of 1852 was the calm before the storm. The issue of slavery, which had been inflamed over the issue of extending slavery to the territories won from Mexico, had been temporarily calmed by the Compromise of 1850. This compromise, like any good compromise had failed to satisfy either side and would eventually contribute to the sectional tensions that led to the Civil War. At the time, however, it seemed reasonable enough and probably did delay the Secession Crisis and the War by a decade. The slavery issue was still out there, however, and since both the Democratic and the Whig parties required a broad, national coalition of North and South to win, neither major party was willing to nominate a candidate who had expressed a strong view on the slavery, or any other sectional, issue. This meant that both parties turned to candidates who had not played much of a role in national politics or had shown strong leadership in the civil government. Neither party was willing to take any real stand on the issues of the day and the Whig and Democratic party platforms were virtually identical. The election of 1852 was to be fought over personalities rather than issues. The Democratic national convention met first, from June 1-5, at the Maryland Institute for the Promotion of the Mechanic Arts in Baltimore, Maryland. The party was bitterly divided between the supporters of the four major candidates, Lewis Cass of Michigan who had been the nominee in 1848, James Buchanan of Pennsylvania who would be the nominee in 1856, Stephen A. Douglas of Illinois, and William L. Marcy of New York. Aside from these, there were various dark horse and favorite son candidates put in the ballots. None of the major candidates were able to obtain a majority of the delegates’ votes and none of them had a consistent lead or momentum over the others. On the thirty-fifth ballot, Franklin Pierce of New Hampshire was on the ballot. Pierce slowly gained votes as the balloting continued and by the forty-ninth ballot he was nominated. Franklin Pierce had been a relatively obscure New Hampshire politician who had served as a Congressman from 1833 to 1837 and as a Senator from 1837 to 1842. He had fought in the Mexican War in command of volunteers from New England and had risen to the rank of Brigadier General. Pierce was personally opposed to slavery but considered the abolitionist the greatest threat to the Union. As a northern with sympathy for the south, Pierce seemed to be a perfect candidate. The Democrats went on to nominate Alabama Senator William R. King as Pierce;s running mate. King was a Unionist who opposed both the abolitionists and the more radical pro-slavery “fire eaters“. As it turned out, King was already very ill with tuberculosis and would die soon after becoming Vice-President. The Whig Party’s convention also met at the Maryland Institute in Baltimore from June 17-20. Like the Democrats, the Whigs were divided. President Zachary Taylor had died after little more than a year in office to be succeeded by his Vice-president Millard Fillmore. Fillmore wanted to be nominated for another term but he was unpopular among some Whigs for his support of the Compromise of 1850 and many Whigs believed that he could not be elected for a term in his own right. They preferred to use the Whig standby of nominating a war hero, in this case, General Winfield Scott. Winfield Scott was one of the most remarkable Americans of the nineteenth century and it is a pity that he is no longer so well known. Scott was a war hero who commanded forces in the War of 1812, the Blackhawk War, the Mexican-American War, and the Second Seminole War. He served as Commanding General of the United States Army from 1841-1861, longer than any other man who has served in that post and he holds the record as longest-serving active duty general in the US Army. In his long tenure as Commanding General, Scott essentially created the army that was to fight in the Mexican War and the Civil War and he wrote the book on the tactics and drill used by the Army from 1840-1855. Scott was not only a brilliant general, but also a compassionate leader who because of his care for the men under his command and his adherence to military drill and discipline was known as “Old Fuss and Feathers. At 75, Winfield Scott was too old and ill to lead troops in the Civil War, nevertheless he did develop the Anaconda Plan of slowly dividing and squeezing the South into submission. This plan was ultimately used by the North, but at the beginning of the war it ran against the popular sentiment of “on to Richmond and end the war by Christmas” that prevailed in the North. Although Scott was proved right in his assessment that an quick and easy victory was impossible, he felt obliged to retire after the disastrous Battle of Bull Run, though Lincoln still consulted him throughout the war.Getting back to 1852, the Whigs nominated Winfield Scott for president after fifty-three ballots and selected former North Carolina Governor and Senator William Alexander Graham. There were a number of third parties, most notably the Free Soil Party which nominated New Hampshire Senator John P Hale for President and Indiana Congressman George Washington Julian for Vice-President. There is not much to be said about the general election. Despite Scott’s skills as a military leader, he was no politician and Old Fuss and Feathers somehow didn’t seem as appealing as Zachary Taylor’s Old Rough and Ready. Scott seemed to be rather too military to be the civilian Commander-in-Chief. The Democrats warned of a “Reign of Epaulets”, contrasting the uniformed, rank conscious, professional Scott with the humble citizen-soldier Franklin Pierce who, like Cincinnatus, left to fight for his country and then returned to civilian life. Scott’s anti-slavery views also did not help him in the South. The Whigs, in their turn, ridiculed Franklin Pierce for his obscurity. They also made use of an incident during the Mexican War in which Pierce fell off his startled horse and wounded himself in his groin and knee. While Pierce’s enemies claimed that he had fainted through cowardice or drunkenness, the truth is that Pierce fought with courage in the Mexican-American War, insisting on leading his brigade after the accident, even though he was in terrible pain. This didn’t stop the Whigs from deriding him as the fainting general and the “hero of many a well-fought bottle”. In the end Pierce and the Democrats won by a landslide. Pierce got 1,607, 510 (50.8%) of the popular vote to Scott’s 1,386,492 (43.9%). 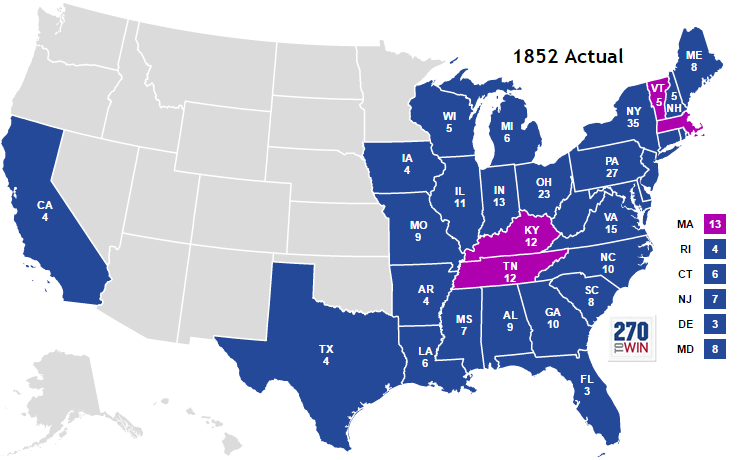 Winfield Scott only won four states; Vermont, Massachusetts, Kentucky and Tennessee so the electoral vote was 254 to 42. The election of 1852 was to be the last presidential election in which the Whigs participated. The devastating loss in 1852, the deaths of party leaders Henry Clay and Daniel Webster that year, and increasing sectional tensions over slavery destroyed the Whigs over the next two years. John Hale of the Free Soil Party got 155,210 (4.9%) popular votes, less than half of their 1848 showing, and no electoral votes. The lessened tensions over slavery in 1852 had caused many of the barnburners to return to the Democratic Party, but by 1856 the Free Soil Party would merge with anti-slavery former Whigs to create the Republican Party. As for Franklin Pierce, he turned out to be somewhat over his head as president. He would have made a decent enough leader in peaceful times but he proved incapable of dealing with rising tensions over extending slavery in the territories and his support of the Kansas-Nebraska Act and enforcement of the Fugitive Slave Act only made the polarization between North and South worse.